Commonly and famously known as the ‘Father of Economics’, Adam Smith made several contributions to the world in the Eighteenth century. Born on June 5th of 1723, Adam was a resident of Scotland and was an economist, an author, a philosopher- a moral philosopher to be precise and most importantly that pioneer of political economy. He was a key figure during the phase of Enlightenment of Scotland. In his contributions, there are two notable works of writing, An Inquiry into the Nature and Causes of the Wealth of Nations and The Theory of Moral Sentiments, released in the year 1776 and 1759 respectively. The former one later got along with the name of Wealth of Nations and is the most important as well the best works of Adam. It was also the first contribution to the world of Modern Economics that we see today. Additionally, he also introduced the theory of producing better and more goods and services- the theory of absolute advantage to a world that was caught with the years’ old schema of ‘Mercantilism’. The foundation of the modern economy or the free market that we observe in today’s time was led by Adam Smith, although he was criticized and opposed in the beginning. He developed thinking that the world’s income was not a fixed pie or figure and can be exploited and increased if the traditional methods will be improvised. His, Wealth of Nations was the ultimate guide to this ideology. His work made the economy more disciplined. He made the market free of classical methods and introduced the division of labour concept. This concept was based on competition and self -interest among the existing commercial industry and maximizing both to new levels of economic growth. Adam and his thoughts were highly controversial in his years and his work was even criticized through the medium of satires by a group of Tory writers who were active under the umbrella of Jonathan Swift and William Hogarth. Yet, after all the opposition, his Wealth of Nations was included in the best 100 books of Scottish time in 2005. What is Adam Smith best known for? What was Adam’s economic theory and idea’s? What did Adam Smith do that was important? What is Adam Smith’s invisible hand? What is the Effect of the Invisible Hand on the Government? What is the difference between Adam Smith and Karl Marx? Who is Adam Smith and why is he important to economics? Adam was born in the city of Kirkcaldy in Scotland. He got his name from his own father, Adam Smith who was a writer, prosecutor, an advocate and even a Financial officer more commonly known as the comptroller to the customs of Kirkcaldy. His father was married to Margaret Douglas. She was the daughter of powerful landlord Robert Douglas of Strathendry which was also in Fife, in Scotland. They got married in 1720. His father died in 1723, just two months after Adam was born. 5th June of 1723 is mainly the date of Adam’s baptism- the ceremony of immersing young kids or sprinkling of holy water on their forehead to mark their birth in the culture of Christianism and is generally proceeded by name giving. This date is also recorded as his birth date as there are no additional records of the same. There are several events of Smith’s young life which have records. One such happening was his abduction at the age of 3, although he was later rescued. He was captured by the gipsies and the incident has been put forward by John Rae, the Scottish journalist. Reports also say that he was close to his only parent left and she was supportive of his ambitions. This was a strong driving force which made Smith complete his scholarly goals and he made exceptional changes to the economic world we all witness today. He was admitted to the Burgh School of Kirkcaldy and it was one of the best in the area during the period 1729 to 1737. It was mainly the time frame when Adam was studying in the school and he learned mathematics, writing, history and Latin in his initial years of education. Adam Smith was very young to join the University of Glasgow at the age of 14. He studied several subjects there and the main ones included moral philosophy under Professor Francis Hutcheson. It was under the roof of this University that Adam developed a liking of free speech, reason and liberty. Smith graduated as a scholar and later got admitted to Balliol College at Oxford as a postgraduate student in 1740 under the Snell Exhibition. After being supported by Lord Kames in 1748, Smith began his career as a lecturer in Edinburgh backed by Philosophical Society. He used to lecture on belles-lettres and rhetoric initially. Later another subject was added to his list: The progress of Opulence. On the newly chosen topic, he preferred a route to provide a better understanding of the same. At first, his own philosophy for the simple and obvious system of natural liberty and then continued exploring the topic. Even though Smith was good in the aspect of public speaking, yet his lectures gave him fame. For the Scottish Enlightenment, Smith shared the same taste with his senior, David Hume, another philosopher in the history of Scotland. They had common thoughts on politics, economics, philosophy, religion, history writing coverings and even at a personal level. David was ten years senior to Smith. Adam Smith began his career as a professor at Glasgow University in 1751. He was mainly associated with the teaching of logic courses. The following year, he was an elected member at the Edinburgh’s Philosophical Society. He was introduced to the society by Lord Kames. Smith became the head of the Moral Philosophy in Glasgow after the death of the head in the year 1753. The upcoming 13 years of Smith at the University are considered among the best years of his life. This academic period was described as the honourable, useful and happiest time of his life, by himself. The famous theory of moral sentiments by Adam Smith was published in the year 1759. It did consist of a few of his lectures at Glasgow University. The gist of the theory is that the levels of sympathy between the agent and spectator cast an effect on human morality, be it is related to members of a society or an individual. Smith said or described that the basis of moral sentiments was what we call as mutual sympathy. He related the term moral sense to mutual sympathy which in today’s era is commonly and easily caught by the word empathy- which the ability of one to understand one’s situation and the feelings he or she might be experiencing being involved in a situation. His method of conveying his theory and explaining it was far different from the others like Lord Shaftesbury third and Hutcheson. The publication had an unbelievable effect on the generation and people of that time. A hint can be taken from the fact that children belonging to rich families back then began to enrol and study under Smith at Glasgow University. Once the theory of moral sentiments was well spread, Smith was now diverted to economics. He lectured and emphasized on the fact that a nation’s wealth is directly proportional to the labour and not to amount of silver and gold, held in the treasures. Smith came forth as a Doctor of Laws from Glasgow University in 1762. He later resigned from his job of a professor after being offered to tutor the young Duke of Buccleuch, Henry Scott in 1764.
he got from his Theory of Moral Sentiments, it was the book of Wealth of Nations that made him popular all over in and after 1776. The economic theory of Smith related to his contributions to the economy of the world and not just Scotland. Apart from the book of the Wealth of Nations, the idea of an invisible hand which is in charge of keeping check of the market and a part of Smith’s famous writings. The job of the invisible hand is done by maintaining the demand and supply curve of the market which signifies the balance. Additionally, he suggested that the role and control of the government should be reduced to a minimum and the market should not be held back because of the interventions and taxes levied by the authorities. 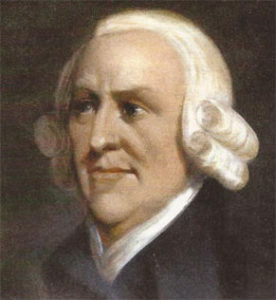 The main aspect that Adam Smith covered in his lifetime was he suggested to eliminate the mercantile system or at least reduce its effect to a minimum. This system existed while he was writing his famous book of The Wealth of Nations. Mercantilism is the policy that was dominant even in the modern parts of Europe starting from the sixteenth century till the eighteenth, until Smith questioned it. The main purpose of the policy was to maximize exports. Although declined in the majority of the then active countries, it is practiced in the name of economic interventionism in some of the industrial countries. This policy promoted control of government over the economy of the nation and targeted balance of trade considerably finished goods. This practice often led to a situation of war and conflict and was one of the contributing factors of expansion. The most important contribution of Smith to the world and more specifically to the economy was the Causes of the Wealth of Nations and The Theory of Moral Sentiments, now commonly goes by the name of Wealth of Nations. This book comprised of knowledge that Smith has acquired over a period of seventeen years. The notes and works of Smith over these years combined with his observations related to conditions of then present day’s economy and norms at the beginning of the Industrial revolution. All in all, Smith was able to complete the first version of the book in ten years. The result was remarkable with the amount of effort he had put in despite being criticized from many. In the end, the facts and observations were able to make the practice of mercantilism and physiocratic theories obsolete. Though these were being becoming less favored for the upcoming era of industrialization and innovation, the Wealth of Nations gave the necessary push. While Smith was alive, there had been five editions of the book released. The first one was released in 1776, then 1778, followed the by other three in 1784, 1786 and 17 89.There were a few more, after the principle author died. The main requirement of the market is to maintain the equilibrium of the demand and supply curve. This aspect is supposed to kept in order by the market force and was given the name invisible hand. It was first used Adam Smith in his book, ‘The Wealth of Nations’. Adam suggested that the pricing and distribution in a free market interact one way or the other with the planning authorities and this should not be intervened by the government for the invisible hand to maintain the equilibrium and maximize the numbers of profit. Although this invisible hand in not an entity whose presence can be seen but only be felt. It is a sum total of the various aspects of the commerce world like consumers and sellers engaged in making a deal beneficial to both ends. Smith suggested that the market should be made to act in private without any government intervention and only when this is done, the world will grow organically. Quoting in simple words, under an industrial system, the dealer or the owner of the product exploits the one who needs it. While Smith believed that this system could get better if the market was free of any control from any authorities and no additional was to be borne by any party then the economy would be most efficient. Marx did not conquer here. He believed that the social order should be communist in order to be efficient. 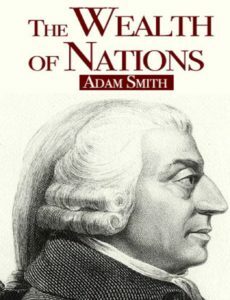 Adam was and even is important to economics for the long term invested contributed by him in the form of his famous book: ‘The Wealth of Nations’. This book formed the basics of the political economy and if often called as the bible of capitalism. Smith was in bad health due to his prolonged illness. It is said that even on his deathbed he was not satisfied with what he had done so far. He died on July 17th 1790 in his Panmure house in Edinburgh. He now rests in the Canongate Kirkyard.